On April 16, Montclair State University hosted Not Just For Techies: A Panel on Humanities-Focused Startups between NJ/NY and Italy. This event, organized by Professor Teresa Fiore, Inserra Chair in Italian and Italian American Studies, and Dennis Bone, Director of the Feliciano Center for Entrepreneurship, demonstrated how the humanities and entrepreneurship are mutually beneficial. Chief Technology Officer of Audible.com Guy Story, one of the conference speakers, surprised the audience by performing a song he had composed for the occasion. Other speakers included co-authors of Tech in the City Maria Teresa Cornetto and Alessandro Piol, and CEO of HyperTV Claudio Vaccarella. ArtMotion Picture produced a short video covering the "Not Just For Techies" forum. Re NJ Arts News productions: our Words Matter project, a series of interviews with New Jersey higher education leaders, is in the editing process and will be aired starting in June on various NJ radio stations. We are also completing another video about sustainable practices in collaboration with Drew University students as part of a civic engagement course on nonprofits taught by Elizabeth Kimball. Picking up on our "economy" exploration: we've observed that the word ‘economy’ is given a wide variety of metaphorical uses and meanings in daily news. Our exploration is not so much to 'understand' various writers' meanings—we deliberately strip away the context—but to consider how widely the uses seem to vary. Yet no one seems to acknowledge possible ambiguity or misunderstanding. Journalists could say "I'm using the word in this... or that sense," but they don't! One indication of just how varied—or flexible—journalistic usage of 'the economy' has become is the number and variety of adjectives applied to the term. 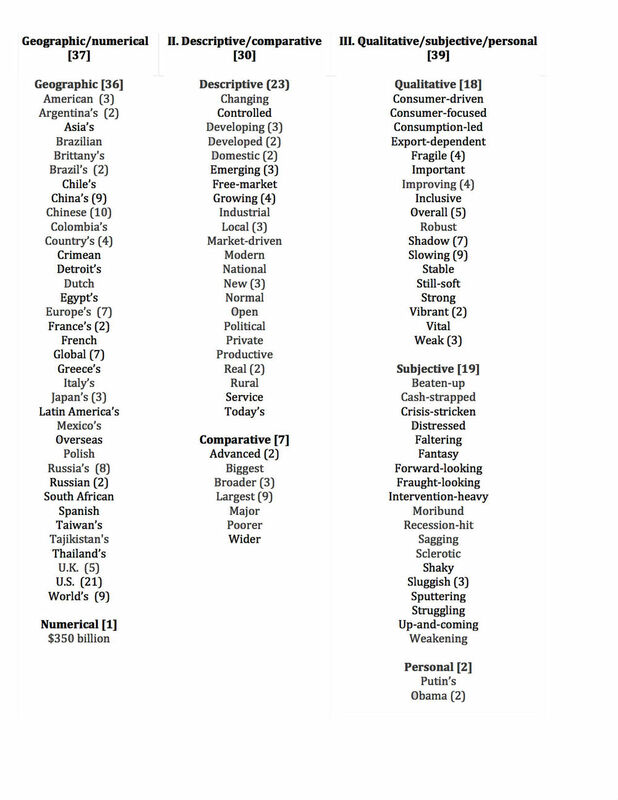 We were surprised to count 106 different adjectives modifying "economy" in the Wall St. Journal and the NY Times news articles, columns, and editorials over a two-week period in March (adjectives appearing in quotes from sources were included). To make sense of this, we parsed out the adjectives into three groups. Naturally, a large number were geographic or possessive, such as 'the Russian economy,' 'the Brazilian economy, or 'Detroit's economy' (37 to be precise). The second 'Group of 30' were common descriptive adjectives such as 'controlled,' 'developing,' 'domestic,' 'emerging,' or free-market.' Most of these seem fairly conventional and logical, although a few, such as 'normal,' or 'private,' might raise some skeptical eyebrows. This group also encompassed 7 comparative adjectives such as 'broader,' 'major,' and 'wider,' adding another little dash of uncertainty. There may be a story here; but for now we'll simply share the list FYI, and point out that the personalized and emotionally-charged usages in Group III seem to stray well beyond the domains of science or social science, as well as the mathematical models and statistics I've analyzed this past semester in a Macro-Economics course. One question: what do you think 'economy' is, that has so many attributes? Has 'the economy' become code for Anything Or Everything Readers Care About in daily news? Enjoy the list. We'd be interested to hear what you think!